By the 1890s, Henry Lawson had established his reputation as a short story writer and poet with 'The drover’s wife' and 'Up the country'. His writing in The Bulletin helped create the image of the Australian bushman as the epitome of egalitarian and national ideals. 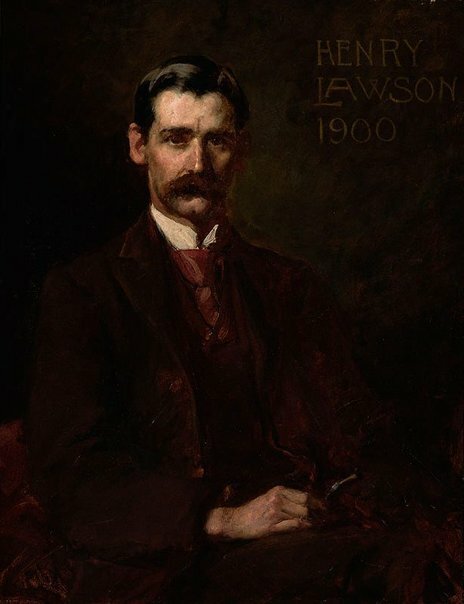 This portrait of Lawson was commissioned in 1900 by JF Archibald, editor of The Bulletin. It was painted in Melbourne shortly before Lawson’s departure for England. Working rapidly, Longstaff captured the poet’s characteristic expression. The finished portrait delighted Archibald and prompted him to establish the Archibald Prize, the non-acquisitive annual portraiture prize first awarded in 1921. Signed c.r. on shoulder, red oil "J Longstaff". Dated u.r., brown oil ".../ 1900". Famous people: a selective who's who from works in the Art Gallery of New South Wales , Sydney, 1981, 9 (illus.). Prue Joske, Debonair Jack , 'Portraits 1895-1901', pg.70-95, South Yarra, 1994, 86-91, 89 (illus. ), 110-111, 148, 176. Lionel Lindsay, Art in Australia [vol. 1, no. 4] , '25 Years of Australian Art', Sydney, 1918. Art of Australia. Vol 1: Exploration to Federation , ‘Individual and national feeling’, pg. 545-610, Sydney, 2008, 589, 590 (colour illus.). A catalogue of Australian oil paintings in the National Art Gallery of New South Wales 1875-1952 , Sydney, 1953, 129. A.G. Stephens, Art in Australia [series 3, no. 2] , 'Henry Lawson', Sydney, Nov 1922, (colour illus.). Bertram Stevens, Art in Australia [vol. 1, no. 2] , 'John Longstaff', Sydney, 1917. Look , Sydney, Oct 2004, 47 (colour illus.). Unknown, Experience of Nationhood: modern Australia since 1901 , Sydney, 2002, 7 (illus.). Unknown, Portrait in Youth of Sir John Longstaff (1861-1941) , North Ryde, 1948, 132 (illus. ), 179-182. Editor Unknown (Editor), The Sydney Morning Herald , Sydney, 11 Oct 1941. The Mercury , 'Loan pictures exhibition: three artists: Sir John Longstaff', pg. 6, Hobart, 19 Aug 1935, 6.